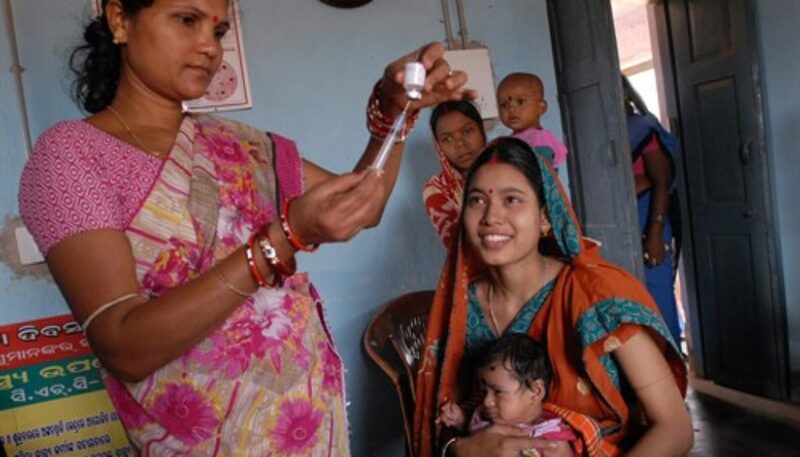 The UK International Development Select Committee – a group of parliamentarians whose task is to monitor development policy – have included evidence from REACHOUT in their new report on health systems. We are delighted that they have turned their attention to the role of community health workers. 65. The REACHOUT Consortium noted that “close-to-community” programmes “are increasingly being initiated and scaled up in response to the human resources for health crisis”, but expressed concern at the lack of evidence on how best to support such programmes. Dr Julian Lob-Levyt warned that CHWs “have been seen as magic bullets for under-funded and poor-performing health services”, but that they required sophisticated integration with other services. Oxfam stressed the importance of complementing CHWs with a system of referral to more expert care, a point reiterated by Angela Spilsbury of DFID. Photo: Pippa Ranger, Innovation Advisor, DFID. Community health worker, Rebati, gives babies like Adilya, polio and other life saving vaccinations for at least the first year of their lives. Britain is working with the Government of Odisha, one of India’s poorest states, and UNICEF, to save the lives of thousands of mums and babies.